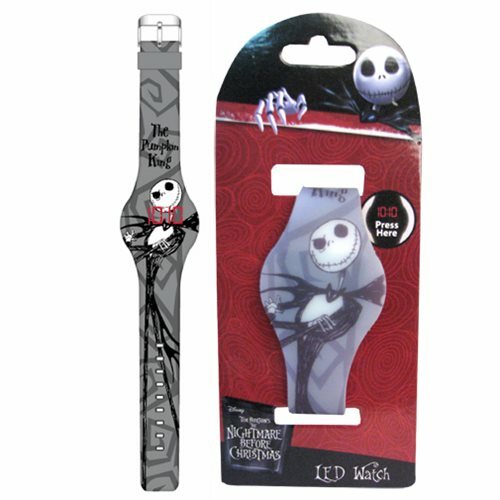 Nightmare Before Christmas The Pumpkin King LED Watch makes a great gift for any fan ofThe Nightmare Before Christmas. The watch features Jack Skellington with his arms folded and is showing off his wide smile. At first glance, this watch resembles a sleek silicone wristband, but with a simple push of a hidden button on the face of the watch, a red LED time lights up to display the time! Total length of the watch measures about 9 1/2-inches long including face. The watch comes packaged on a firm cardboard backing. Ages 13 and up.